Ever get a new pair of pants and they just don’t fit right? Or they’re just too long? Maybe your favorite sweater or jacket zipper breaks. 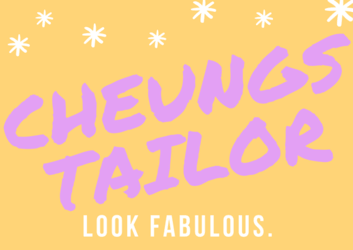 Well, if you find yourself in need of a new wardrobe or wanting to replace that old zipper with something sturdier Cheung’s Tailor Alterations is here! From snaps, to buttons, zippers, we do it all; our services provide affordable repairs to all your clothing needs. Maybe you get a new sweater and you don’t like the hood – let us remove it, or the string in the hoodie accidently came out – we can replace it, or summer time is rolling around and you’d like to make those long sleeve shirts into short sleeves. Redesigning on Dresses – Let out your creative side out! Pressing ~ only worked areas are lightly pressed. Design scarves, ties, pajamas, pillow cases, graduation blankets, if you have an idea let’s work together! Congratulations! Weddings can be very stressful and fun at the same time, here at Cheung’s Tailor we’ll take care of you. You found your favorite gown, but it may not be the perfect fit. All gowns need some sort of alterations, from a small bustle, a hem, or even redesigning the top we can help change your overall fit to make it flawless. From any frame (hour glass, triangle, rectangle, inverted triangle) to any style and brands (chiffon, lace, beaded) we have you covered. – Does the dress slide on your body ~ might need to take in the sides. – Can you comfortably sit ~ is the top too tight. – How do you present yourself in front of a mirror ~ adding bust cups. – Is there a particular style you hope to add ~ Customizing the dress. The possibilities of changes are endless, let’s talk about it! Cheung’s Tailor Alteration has a combined 60+ years of experience, we encourage you to check out just some of the work we have performed in the past and comments from the happy brides! *We encourage you to bring in the shoes you plan to wear the night of the wedding if necessary! You’ve just been asked to be a bridesmaid or maid of honor – congratulations! At Cheung’s Tailor attention to detail is crucial to success. We believe being a bridesmaid it should be all glitz and glamour. In fact that’s why we’re here! We understand that planning and timing is important, so if alterations are even a last minute to-do on your list we can make it happen. Cheung’s Tailor Alteration can help with your measurements before you go dress shopping too! Remember it’s her day and we know you’re not ‘maid,’ of money. Come on in for a free consultation before the fitting. It’s rare to find a dress that fits perfectly without any work. But you want to look your absolute best for (—insert dance here—) i.e. Prom ~ Homecoming ~ Quinceanera ~ Spring Fling ~ Sadie Hawkins. You’ve browsed countless hours of different prom dresses, some too big, others too small, it does not matter. If you set your sights on the perfect looking dress and it isn’t the perfect fit Cheung’s Tailor Alteration is here. Don’t wait; once you’ve found the perfect dress allow plenty of time for the alterations to be completed. We encourage you to look at different designs and our past work, if you find something you’d like to add or remove from the dress let us know. Prom only comes around a few times in a lifetime; let us make your night special ~ especially the dress! Cheung’s Tailor Alteration can help with your measurements before you go dress shopping too! *We encourage you to bring in the shoes you plan to wear the night of the dance if necessary!